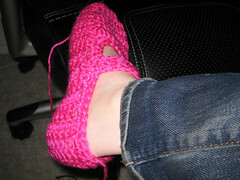 I finished crocheting my first pair of slippers last night. After weeks of crocheting for gifts, this is the first thing I’ve crocheted for myself since the first few experimental projects. So it’s the first good thing I’ve made for myself. I finished them in two nights of crocheting casually. I used this pattern. I made them in only one color. I also made a regular strap instead of the loop thing and sewed it on instead of using a button. They’re a little loose for me, but they seem “normal” with socks. I think if I make another pair I’ll try going down a hook size or something. I do have smallish feet though. 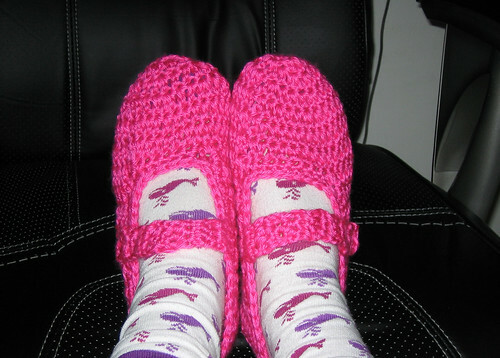 These are my first slippers and I’m pretty happy with them. I’m wearing them right now! 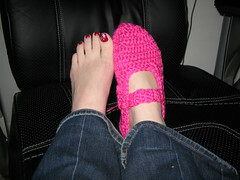 This entry was posted in Home and tagged crafts, crochet, projects, slippers on December 30, 2009 by Shannon. If you saw my post about making my first baby booties for my new soon-to-be cousin, you know I started crocheting recently. I made this holly ornament for our annual ornament exchange and craft party. This is the ornament I will exchange. I finally got the front loop/back loop thing down with this project. Here’s the project on Ravelry. I’m planning to give this to my grandma for her birthday, which is December 24. It’s a dishcloth pattern but I’m calling it a trivet. Here’s the project on ravelry. 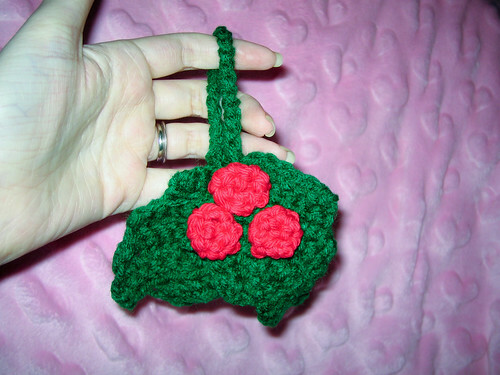 This entry was posted in Journal and tagged crafts, crochet, projects on December 8, 2009 by Shannon. I made these booties for my aunt Erika’s baby shower for my new little cousin Zachary. It’s my first pair of booties, and also my first finished crochet project. 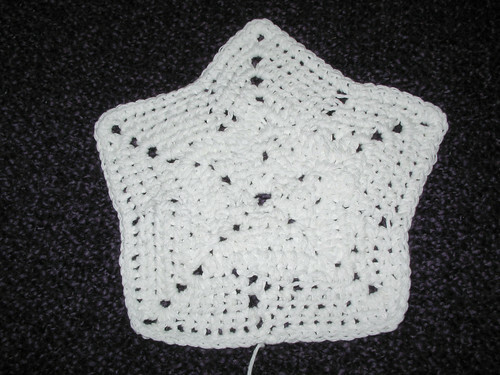 My mom had shown me a few years ago, but I had never made anything but a misshapen square.Gramma made the pom-poms. I couldn’t remember how to get started so I followed the beginning tutorials in a book and learned the basic stitches. I looked up a video on youtube if I was unclear from the written instructions. Once I had a a long block of all my test stitches I started on my booty pattern. My first try didn’t come out right. The next morning I showed my grandma and though she’s more of a knitter, she was able to clear some things up in the pattern. The second one came out fine, we sewed it up and put on the pom-pom. My next one came out alot bigger than the first, so I had to do it again and that one matched. I didn’t tell my mom I had made them until Erika opened them at the shower, and she was really surprised. I’m hoping to make some Christmas presents by crochet. 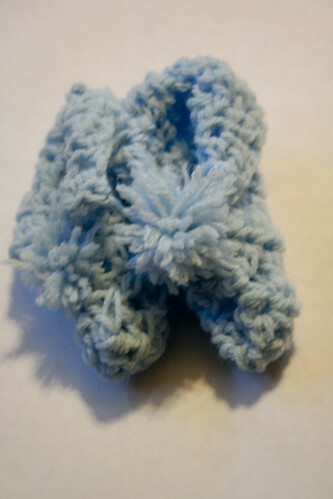 This entry was posted in Journal and tagged baby shower, crafts, crochet, projects on November 22, 2009 by Shannon. Made this “little person” in Cheetah 3D. 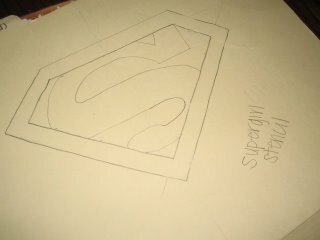 This entry was posted in Graphics, Journal and tagged 3d, games, learning, projects, work on July 27, 2009 by Shannon. 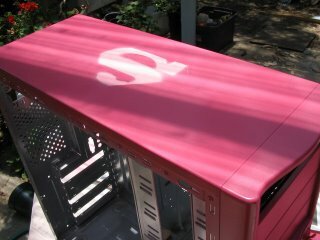 Finally, here is the build log from my most recent PC build. 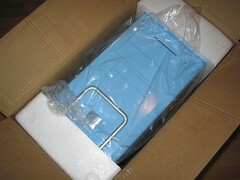 This new PC was put in the lovely blue case you see pictured, and I named her “Streaky” after Supergirl’s cat. 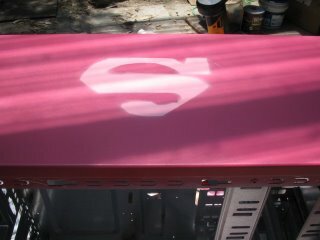 You may recall that my pink Supergirl Linux box is called “Comet” after Supergirl’s horse. This entry was posted in Journal and tagged build log, computers, geek, PC, projects, tech on January 12, 2007 by Shannon. 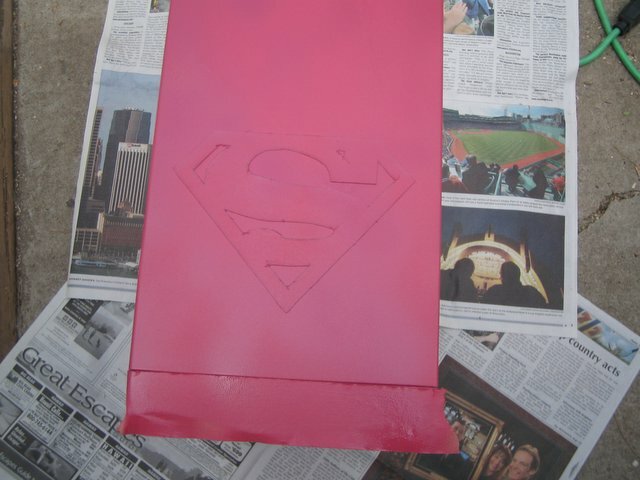 Okay, the top coat is on and dry, and I’m ready to assemble! Here I am, ready to start. I RAM! I’ve got two sticks of 256mb each. I predict that this crazy sound card snagged out of my dad’s old PC will be the bane of my existance. It’s a Creative SoundBlaster Audigy. Here I am with my new box! I have successfully installed Kubuntu Linux onto my new box. I booted with System Rescue CD first to wipe the drive because it was my younger sister’s old drive and who knows what could be on there. Then I had no problem installing Kubuntu with the dvd I burned from the iso. It looks so pretty! I named the computer Comet, the name of Supergirl’s horse. I set the new box up to use a KVM so it’s working fine sharing the keyboard and monitor with my Windows box, but I did have some trouble with the mouse, so I just have two different mice plugged in for now, and I’ll look into that later. Here’s a screenshot for my Kubuntu desktop on my new machine. I was quite pleased with how configurable it is. 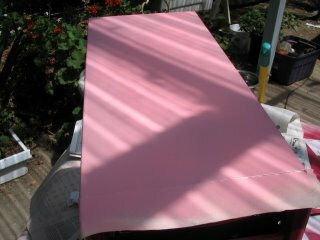 I was easily able to create and use a pink fading pattern on the panel(at the bottom). I was pleasantly surprised when I pressed print screen and a little box popped up, allowing me to save the screenshot as a png! 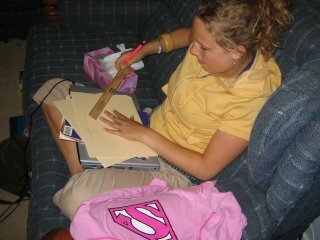 This entry was posted in Journal and tagged computers, linux, PC, pink, projects, supergirl on July 4, 2006 by Shannon. I *heart* RAM! I’ve got two sticks of 256mb each. 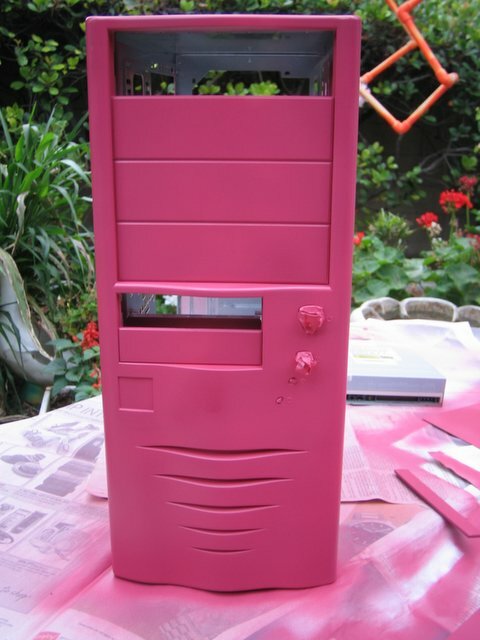 This entry was posted in Journal and tagged computers, linux, PC, pink, projects on July 4, 2006 by Shannon. Okay, I think I’ve finally got it right. I printed out a template on some card stock and cut it out. Then I stuck it to the top. I actually used a gluestick because I didn’t have any double stick tape. Actually, it worked pretty well, but if you try it make sure you get any glue residue off of the parts you want the paint to stick to. I went around it after I stuck it down with a damp paper towel. 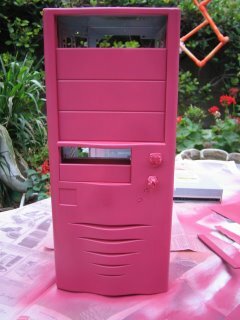 Okay, so then I sprayed it over with the dark pink again. This entry was posted in Journal and tagged computers, linux, PC, pink, projects, supergirl on June 30, 2006 by Shannon. So I decided that I need to do the stencil in 2 parts, so here I am doing the S part of it on the side of the case. Success! not perfect, but I think it looks pretty good. 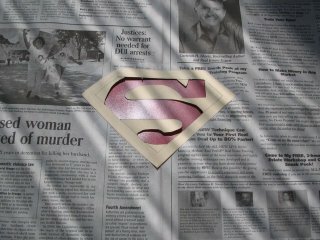 I waited for the stencil to dry and did one on the top too. 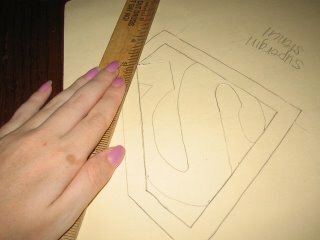 I taped it down more this time and I think I actually got a little more under the edges. I think it was the angle, though. I’m not very tall. I think it’ll still look good once I get the border part on, though. 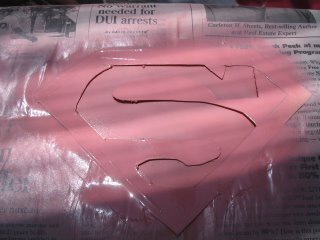 I may also go over it with the original color to clean up some of the spots that the light pink got through. And I did actually have to put on some sunblock to go outside and paint, because it’s 100 degrees outside on our patio. 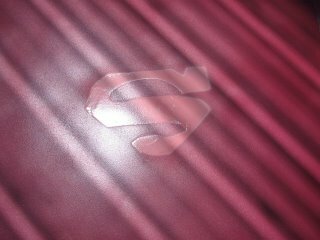 This entry was posted in Journal and tagged computers, linux, PC, pink, projects, supergirl on June 28, 2006 by Shannon. the lighting’s different though, it’s cloudier today. 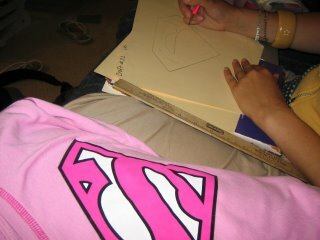 Okay, here’s my younger sister drawing a stencil for me. I brought out a shirt for her to use as a guide. 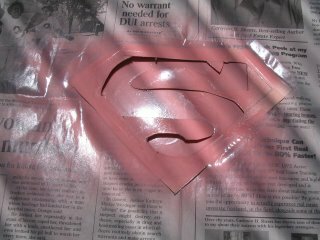 This entry was posted in Journal and tagged computers, linux, PC, pink, projects, supergirl on June 27, 2006 by Shannon.